Google Directory, the example website used in this guide is no longer available as it has been shut down by Google. The concepts in this guide are still valid though. If you want to update this guide to use a new (working) site, your contribution will be more than welcome!. See Contributing to Scrapy for information on how to do so. This document explains how to use Firebug (a Firefox add-on) to make the scraping process easier and more fun. For other useful Firefox add-ons see Useful Firefox add-ons for scraping. 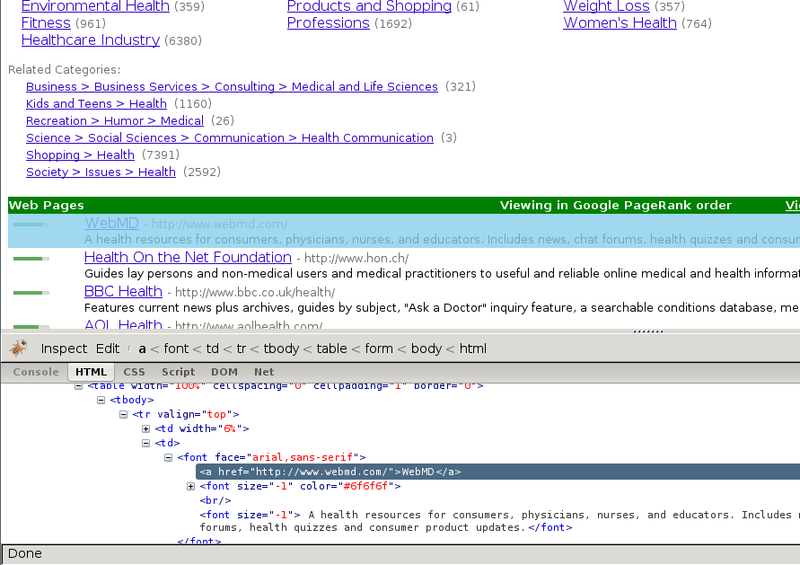 There are some caveats with using Firefox add-ons to inspect pages, see Caveats with inspecting the live browser DOM. In this example, we’ll show how to use Firebug to scrape data from the Google Directory, which contains the same data as the Open Directory Project used in the tutorial but with a different face. Firebug comes with a very useful feature called Inspect Element which allows you to inspect the HTML code of the different page elements just by hovering your mouse over them. 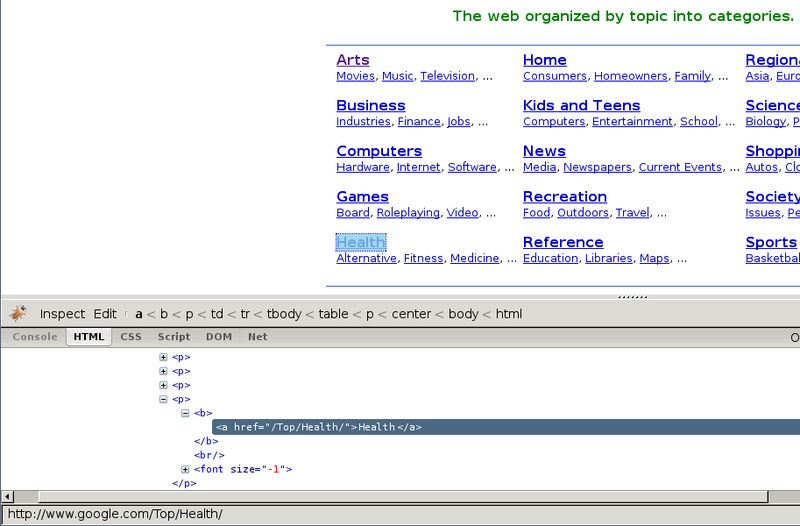 Otherwise you would have to search for the tags manually through the HTML body which can be a very tedious task. 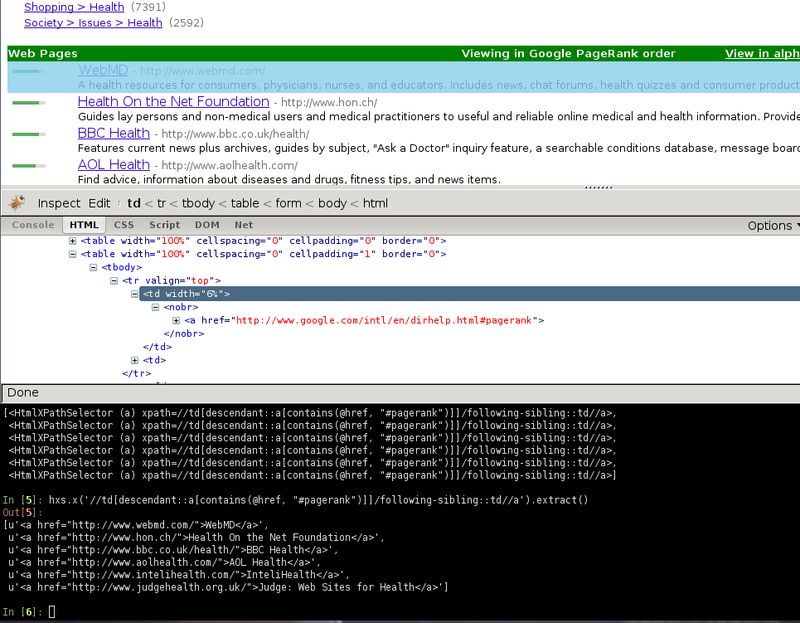 In the following screenshot you can see the Inspect Element tool in action. At first sight, we can see that the directory is divided in categories, which are also divided in subcategories. As expected, the subcategories contain links to other subcategories, and also links to actual websites, which is the purpose of the directory. The Rule object instructs CrawlSpider based spiders how to follow the category links. parse_category will be a method of the spider which will process and extract data from those pages. Now we’re going to write the code to extract data from those pages. With the help of Firebug, we’ll take a look at some page containing links to websites (say http://directory.google.com/Top/Arts/Awards/) and find out how we can extract those links using Selectors. We’ll also use the Scrapy shell to test those XPath’s and make sure they work as we expect. As you can see, the page markup is not very descriptive: the elements don’t contain id, class or any attribute that clearly identifies them, so we’ll use the ranking bars as a reference point to select the data to extract when we construct our XPaths. After using FireBug, we can see that each link is inside a td tag, which is itself inside a tr tag that also contains the link’s ranking bar (in another td). So we can select the ranking bar, then find its parent (the tr), and then finally, the link’s td (which contains the data we want to scrape). It’s important to use the Scrapy shell to test these complex XPath expressions and make sure they work as expected. Be aware that you may find some elements which appear in Firebug but not in the original HTML, such as the typical case of <tbody> elements.